Salmon Dying in the Northwest? officials are viewing this year's crisis as a potential window into the future. 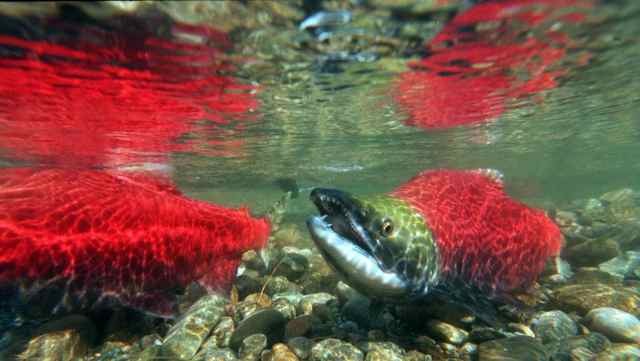 Each year, around July 1, thousands of sockeye salmon pass the Columbia River's Bonneville Dam on their way to their spawning grounds in northern Washington and Canada. Centuries ago, sockeye salmon runs could be as large as three million fish. Last year -- in the largest run since the construction of the Bonneville Dam in 1938 -- 645,100 sockeye made the trip from the Pacific through the Columbia River. But this year -- with snowpack levels throughout the Pacific Northwest historically low and temperatures historically high -- sockeye salmon are in trouble. Out of the more than 507,000 salmon that have passed through the Bonneville Dam, some 235,000 have died -- a number that Oregon Department of Fish and Wildlife fisheries manager John North told Reuters is unprecedented. "We've never had mortalities at this scale," North said. Temperatures at parts of the Columbia River are some five to seven degrees warmer than average. At the Bonneville Dam last week, water temperatures exceeded 72 degrees, about five degrees above the 10-year average for that spot according to the Seattle Times. "The water temperatures in the Columbia River are nearing lethal levels for salmon, which is a little inconvenient if you're a salmon trying to come into the Columbia River and migrate," Teresa Scott, Washington Department of Fish and Wildlife's drought coordinator, told ThinkProgress. "It's a matter of fish being caught in those warm waters and not being able to deal with them." Hatchery in the Columbia River Gorge. When water creeps up to the mid 50s and into the 60s, he told ThinkProgress, it creates a more challenging environment for sockeye. Warm water holds less dissolved oxygen, making it more difficult for fish to breathe. High water temperatures also stimulate the fishes' metabolism, causing them to burn through crucial energy stores faster than usual and leaving little energy for the last legs of their journey. But warm water doesn't just create a less hospitable environment for fish -- it also creates an ideal breeding ground for microscopic foes. According to Scott, the fish found dying near the Bonneville Dam have been exhibiting signs of a serious infection. "It gives a leg up to all the pathogens that they're evolved and adapted to be able to fight off with normal immune system function," Ahrens explained. "Bacteria, pathogens, and viruses get more and more effective at doing their jobs when the water gets warmer, and fish less so." Ritchie Graves, a fisheries biologist at NOAA, told the Associated Press that up to 80 percent of this years' returning sockeye population could die as a result of the above-average temperatures. This year marked some of the Pacific Northwest's lowest snowpack levels on record, with levels in Washington just 16 percent of normal and levels in Oregon at 11 percent of normal. The latter marked the the lowest snowpack level seen in the state since 1992. Despite normal rainfall amounts throughout the two states, both have declared drought emergencies, in 23 Oregon counties and statewide in Washington. The region is also coming off of a historically warm end to June and beginning of July, when temperatures soared into the 90s and 100s for days at a time. The warm air temperatures combined with particularly low water flows to create what Scott described as a "perfect storm of conditions." "These are completely anomalous circumstances," Scott said. "The convergence of the really high temperatures that we didn't know were coming our way combined with the low flows because of the low snowpack, I know it surprised me. We're doing, as an agency and a group of state agencies, everything we can to get out in front of these impacts, but we can't make the water cooler in the Columbia River." It's a situation that, Ahrens says, has little precedent for fish managers out West. "There is no norm anymore," he said. "We're seeing a very different environment and a challenge that we haven't seen fish have to face before." Historically, if the main migration paths became too warm, sockeye would divert their migration to smaller tributaries in search of relief. This year, low water levels and high temperatures mean that relief is hard to come by. On a case by case basis, Ahrens says, management officials can choose to pull fish out of warm water and transport them to cooler waters, or release cooler waters from reservoirs to bring down the river temperature. But those are dramatic, expensive measures, sometimes costing as much as $500,000 for a few months of cold water relief for the fish. Ahrens describes one of the season's "success stories" at the Warm Spring National Fish Hatchery in Central Oregon, where Fish and Wildlife officials moved 160,680 salmon to the Little White Salmon National Fish Hatchery, in the Columbia River Gorge, in order to save them from water temperatures that were exceeding 70 degrees Fahrenheit in the daytime. "We do very well with what we have, in terms of a budget, but there's not an endless source of money to combat these issues," Ahrens said. "We have to live within our budgeted means." In Washington, where the state legislature appropriated money for a drought response, Scott says that available technology -- not budget constraints -- are the primary issue. "Even with infinite money you can't be everywhere at once," Scott said. "I wouldn't say budget constraints are the big problem. It's how quickly the conditions are converging on us." Both Oregon and Washington have responded to the salmon deaths by closing some portions of streams and rivers to recreational fishing and cutting back on allowed fishing hours throughout most of the states' rivers. According to Scott, Washington has chosen to close upwards of 30 streams for catch and release fishing because it puts too much stress on the fish. Both Washington and Oregon have also closed off sturgeon fishing upstream of the Bonneville Dam, after reports showed an increased sturgeon mortality due to drought conditions. Earlier this month, Idaho declared an emergency due to the mass sockeye deaths in the Columbia. The Snake River sockeye -- which has been listed under the Endangered Species Act since 1991 -- ends its migration in central Idaho's Redfish Lake. Officials were concerned that warm Columbia River temperatures would prevent the endangered fish from reaching the lake, so fisheries managers trapped the sockeye near the last dam on the Snake River and trucked the fish to a hatchery. According to a KTVB Idaho report, emergency measures for the Snake River sockeye will continue through the end of spawning season, in October. But as climate change threatens to alter the way water is managed throughout the West -- with high temperatures and low snowpack becoming more and more common -- officials are viewing this year's crisis as a potential window into the future. "There's no doubt on the part of our climatologists that say that these are the kinds of conditions that we will see in the future," Scott said. "We are mounting short term responses this year, and anticipating a recovery from these conditions in the near term, but certainly this is a wake up call and a dress rehearsal for what fishery managers years from now will be dealing with on a regular basis." Why Are Hundreds of Thousands of Salmon Dying in the Northwest?